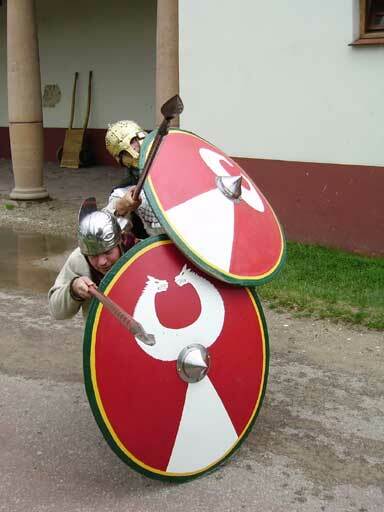 Andreas and me started thinking about a Late Roman event already back in 2003. After several shortlived attemps by others to organise such an event, it was not until last summer that we at last made some headway when Archeon asked us to organise it there. Then it took another 6 months to get the groups together, some being added and some having to cancel. But with the start of the summer season, we had a glorious attendance of no less than 70 people, 50 of them Late Roman soldiers. 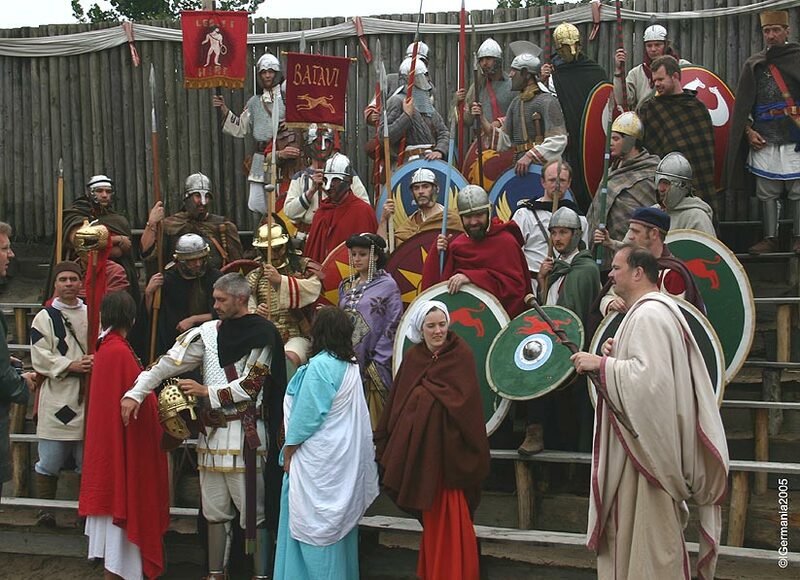 And with that it was not only the first Late Roman event organised on the European continent, it may also be one of the best attended. 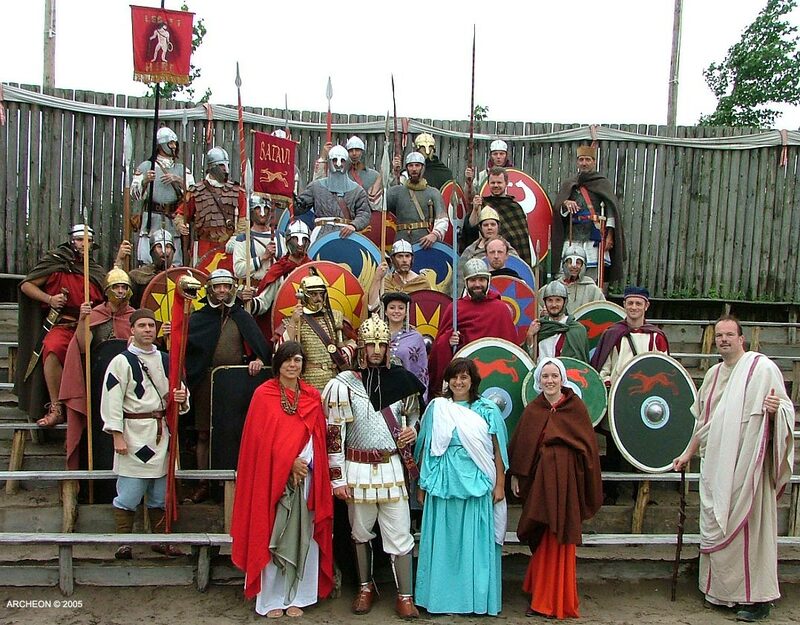 Fectio, together with the Herculiani, Foederati, Teuxandrii, Dun Gwalch, Minervii, Batavi, Legio I Germanica and Litus Saxonicum, we all made sure it turned out to be a great event! Click for the large image. In retrospect, the weather could have been better, there could have been more public, but for all of us it was simply great. We all had very much fun, managing to keep language problems at a minimum; the Spanish hardly spoke English but a few, as did the French, Belgians and Germans, whereas no one spoke Dutch. But we got by well enough to exchange loads of information, we even managed to get all the groups to work together during some very neat performances. Our main thanks go to Monty, who performed brilliantly (as usual) at presenting many of the performances. Garrelt, you and Rob did a great job organising the fighting, even when almost none of the groups had ever met before. Besides that you were a great 'general' at the 'parade'! Ivan, thank you for bringing your great group all the way from Spain and of course Patrick and Alain, where would we have been without the smart troops that you brought with you? And a big thank you to Jack, thank you and Archeon for taking the gamble in hosting this event. Also my thanks go to all those who I did not name here, all of you made this event something very hard to forget. See you all next year!